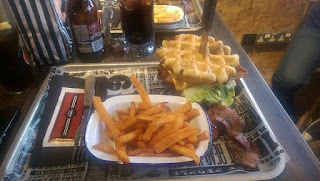 Red's True BBQ - Nottingham. 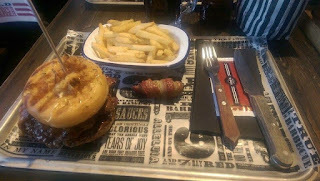 You may have seen by somewhat disappointing review recently from my visit to Rub in Nottingham. 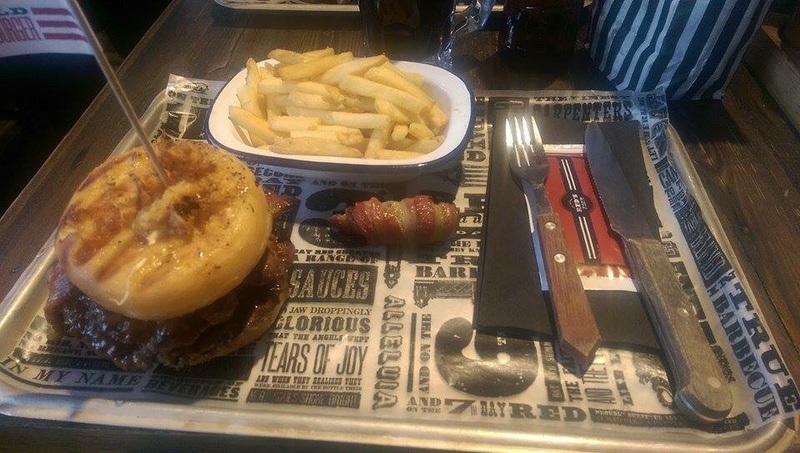 I was recommended Red's as a result of this and was assured that this place was so much better and I was not disappointed. We visited on Saturday lunch and luckily managed to get a table straight away (by the time we left, there was a 15-20 minute wait on tables) which was really lucky as you can not book on weekends. We were greeted by the friendly waitress and taken through to our table just in front of the BBQ grill which was great to be able to see the chefs at work. My first impression was that the inside was a lot bigger than it looks from the street, I was quite surprised. The interior had a kind of an industrial/ grungy basement feel to it which is quite popular at the moment, but done in its own way. The bar area stood out the most, it looked unique compared to ones I've seen before. This picture doesn't really give it justice, it's much better in person. Also, the toilets were quite unusual too! They had a large sink in the middle made from pipes which was different and the toilets themselves were black!? (The smallest things amaze me). They kind of reminded me of what I imagine a Brothel to look like. Low lighting, red curtains etc. but that's just what I thought!! The menu had a nice amount of choice, mainly with the standard ribs and burgers etc, It is a BBQ afterall! I did find the menu quite hard to understand, the pages and layout are a tad confusing and I wasn't really sure what I was looking at to begin with, but I got the hang of it after a while. I did think it was clever how all of the food on the menu has a recommended drink by the side of it. To drink, I chose a diet Pepsi (boring old me) and Ashlea went for a Root Beer which I now know doesn't contain alcohol. 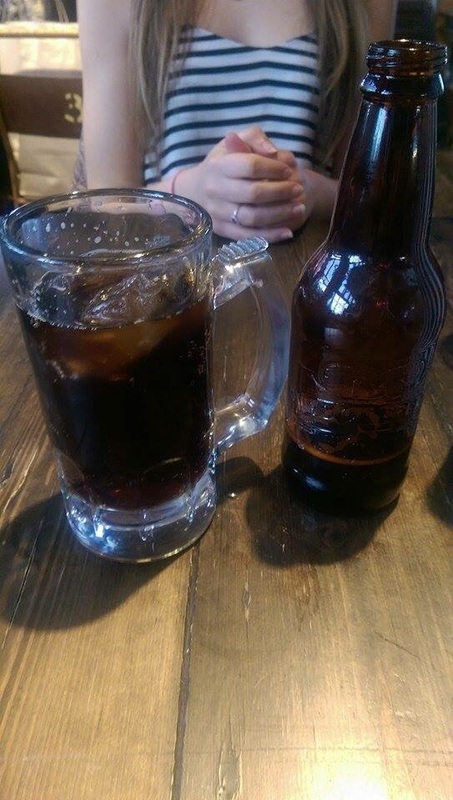 It's a soft drink. At the point of ordering drinks, we were asked if we wanted any of the homemade snacks that they make. These were either Beef Jerky, Crackling or Sweet Potato Chips. 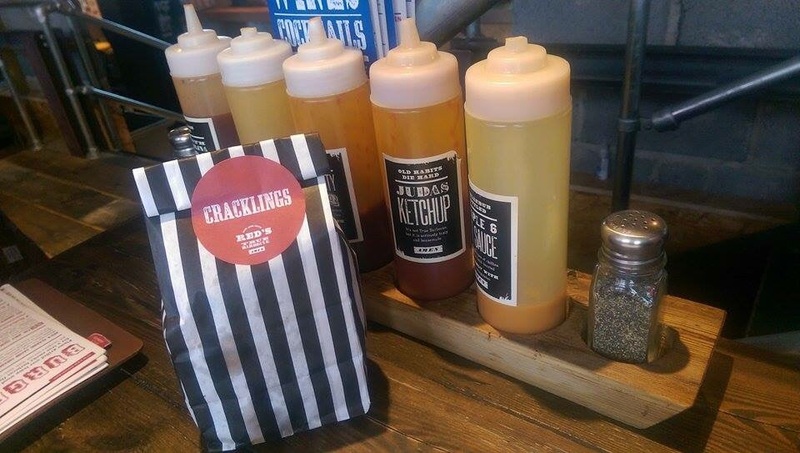 I wasn't fussed, but Ashlea wanted crackling so we ordered one of these too. They come served in a cute little striped bag which was a nice touch. I tried one, but crackling isn't my thing at all, but was told they were delicious apparently. When it came to ordering food, I went for 'The Sleepy James' which was a burger/ sandwich creation made from waffles as buns, Southern fried Chicken, bacon, cheese, lettuce and ranch dressing along with a 'Divine side' of sweet potato fries. It was like eating heaven, so good. I would eat this every day if i could. 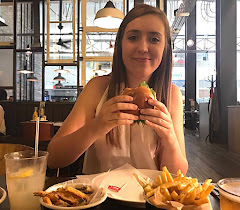 Ashlea went for 'The Donut Burger' which was two 5oz burgers, cheese, bacon, crispy onions and dirty sauce served between two glazed donuts which came with fries and a bacon wrapped jalapeno pepper. I'm told this was amazing too. Both mains come with a little wet wipe which was really useful at the end. Things got messy. Everything had to be dismantled. I couldn't fit in a dessert afterwards, but I did have a quick nosy. Luckily, there was nothing that really tempted me which would have been disappointing had I wanted one. Our waitress cleared the table and gave us the bill. 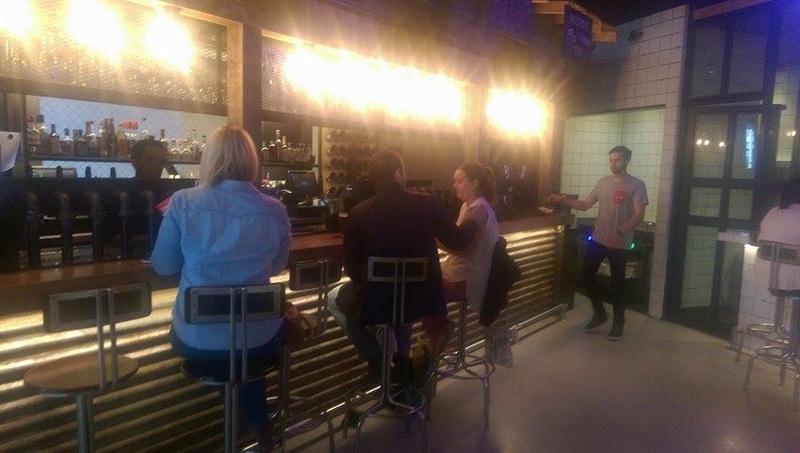 I was really pleased with how good this place was and it is great value for money. This came to £36. We had a chat and I explained to her how I came about visiting and assured her that Red's is so much better than Rub. The only downside that I had about my visit is that afterwards, I smelt of smoke. It was like I had been to a bonfire and was covering my clothes and hair. I don't know whether this is different for where you are sat in the restaurant, but like I mentioned, we were sat opposite the grill. I would definitely recommend this place to anyone who is going to Nottingham City Centre.